The city of Temirtau in central Kazakhstan is best known for a large steel manufacturing facility that is now operated by the ArcelorMittal Group. Our guide brought us for a quick look at the industrial wasteland that represents the plant, where we had a few minutes to appreciate (!) the distinctive odour from the many smoking chimneys. He also brought us to see the steelworker's monument in the city, which I'm given to understand is pretty much the only attraction of interest in the area for the majority of visitors. Children's Park East looked like it had seen better years. The area closest to the entrance was in reasonable condition, and included a handful of relatively new attractions from SBF Rides. 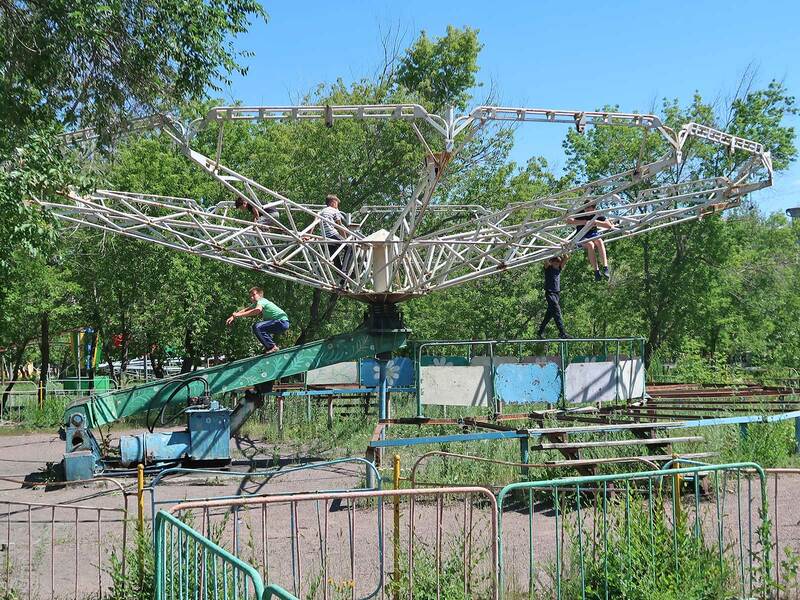 The rest of the facility was dilapidated and overgrown, bearing more than a passing resemblance to the amusement park at Pripyat. A train ride looked like it hadn't moved in years, and a number of local children could be seen entertaining themselves by spinning what was left of a Paratrooper. There was no sign of activity near the roller coaster, so we dispatched our guide to investigate on our behalf. Soon after he reappeared with bad news and good news; the ride wasn't due to open until 1:00pm, but he'd found someone who would operate it for our group as a special favour. This individual materialised soon afterward, and we were able to board Caterpillar (#2476) for three standard laps. A number of local children had heard the ride going and formed a queue at the entrance, and were not overly impressed when our new friend told them to come back later! We had a bit of time to spare before our evening train to Astana, and decided it was worth using it for a second visit to Karaganda Central Park for some daylight photos and a few more laps on Roller Coaster. The weather was glorious, making our three circuits an absolute joy. One wonders if the late Herr Schwarzkopf ever dreamed that more than fifty of his roller coasters would still be thrilling guests almost two decades after his death.